Original cast in new V TV show? Many fans of the original V have mixed feelings about ABC’s upcoming reboot. They may feel better knowing that the producers of the new show aren’t totally abandoning the sci-fi story’s past. 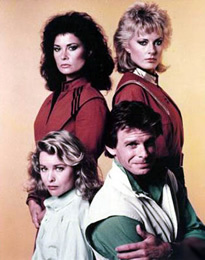 At the recent TCA press tour, one of the new show’s executive producers, Scott Peters, told Sci Fi Wire that Jane Badler may actually have a role in the new V. Badler, who lives in Australia, played one of the original V’s most memorable aliens, Diana, in both the mini-series and the weekly show that followed. Peters noted that Badler actually contacted them, has kept in touch, and may have a part in the new show. Do you think the new V will succeed? The ABC remake of V is set to premiere on November 3rd. Are you excited for the new version or should they have left the concept alone? V: ABC TV Show Returning in January, Will It Last? V: ABC Series Gets Three New Castmembers, Will They Help? V: Is the ABC Series Already Doomed to be Cancelled? V: Great Debut Ratings But Will They Last? Cancel or Keep It? while viewing ones opinion i believe they done a fanastic job with keeping the viewer hook at watching the new V tv series, i think it would be great to see Jane Badler as Anna mother on the new series she had alot flair to old series. I have really enjoyed the new show, they have shown that they can take any old show and make a remake and can keep it fresh for the view, i think it is cool that they are bringing bac, Diana as anna mother in think it will make show better.